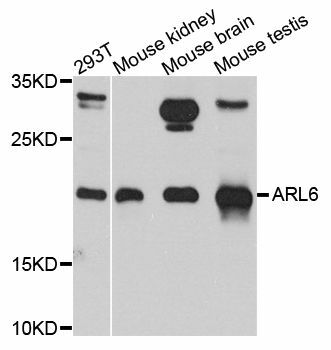 Small volumes of anti-ARL6 antibody vial(s) may occasionally become entrapped in the seal of the product vial during shipment and storage. If necessary, briefly centrifuge the vial on a tabletop centrifuge to dislodge any liquid in the container`s cap. Certain products may require to ship with dry ice and additional dry ice fee may apply. The protein encoded by this gene belongs to the ARF-like (ADP ribosylation factor-like) sub-family of the ARF family of GTP-binding proteins which are involved in regulation of intracellular traffic. Mutations in this gene are associated with Bardet-Biedl syndrome (BBS). Alternative splicing results in multiple transcript variants of this gene. A vision-specific transcript encoding a different protein has been described (PMID: 20333246). Western blot analysis of extracts of various cell lines, using ARL6 antibody at 1:1000 dilution. 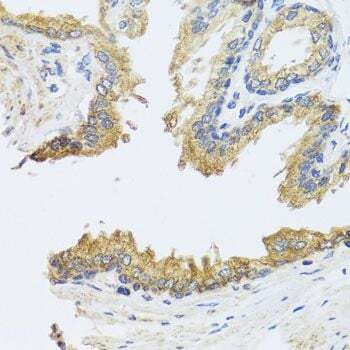 Immunohistochemistry of paraffin-embedded human prostate using ARL6 antibody at dilution of 1:100 (40x lens). 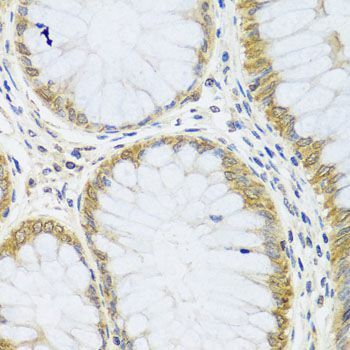 Immunohistochemistry of paraffin-embedded human colon using ARL6 antibody at dilution of 1:100 (40x lens). 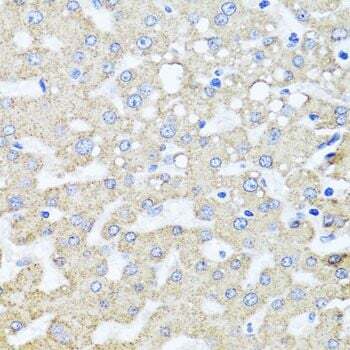 Immunohistochemistry of paraffin-embedded human liver injury using ARL6 antibody at dilution of 1:100 (40x lens). 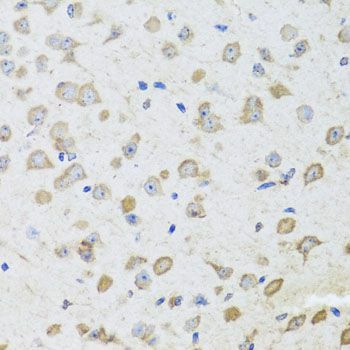 Immunohistochemistry of paraffin-embedded mouse brain using ARL6 antibody at dilution of 1:100 (40x lens). NCBI/Uniprot data below describe general gene information for ARL6. It may not necessarily be applicable to this product. ARL6: Involved in membrane protein trafficking at the base of the ciliary organelle. Mediates recruitment onto plasma membrane of the BBSome complex which would constitute a coat complex required for sorting of specific membrane proteins to the primary cilia. May regulate cilia assembly and disassembly and subsequent ciliary signaling events such as the Wnt signaling cascade. Isoform 2 may be required for proper retinal function and organization. Defects in ARL6 are a cause of Bardet-Biedl syndrome type 3 (BBS3). Bardet-Biedl syndrome (BBS) is a genetically heterogeneous disorder characterized by usually severe pigmentary retinopathy, early onset obesity, polydactyly, hypogenitalism, renal malformation and mental retardation. Secondary features include diabetes mellitus, hypertension and congenital heart disease. Defects in ARL6 are the cause of retinitis pigmentosa type 55 (RP55). RP55 is a retinal dystrophy belonging to the group of pigmentary retinopathies. Retinitis pigmentosa is characterized by retinal pigment deposits visible on fundus examination and primary loss of rod photoreceptor cells followed by secondary loss of cone photoreceptors. Patients typically have night vision blindness and loss of midperipheral visual field. As their condition progresses, they lose their far peripheral visual field and eventually central vision as well. Belongs to the small GTPase superfamily. Arf family. 2 isoforms of the human protein are produced by alternative splicing. 1. Results show that BBS1 and BBS3 regulates the ciliary traficking of PC1.